At the Star Festival, held in the Mushroom Kingdom every 100 years, Bowser steals Peach's Castle with his airships and UFOs and escapes to the center of the universe. Mario tries to follow, but falls and wakes up on a small planet where he meets Rosalina, pilot of the Comet Observatory. 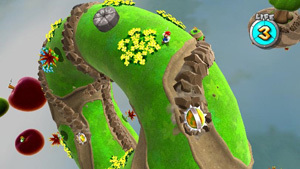 Mario must recover the Power Stars stolen by Bowser so the observatory can reach Bowser's hideout. There are 42 Galaxies to visit and 120 Power Stars to collect. Mario can now perform a spin to attack enemies and activate Launch Stars. His new power-ups include the ability to transform into a Bee, Boo	or	a Spring to reach new areas. In the Toy Time Galaxy, you can see an 8-bit Mario sprite from Super Mario Bros. in the background. This sprite is actually part of the stage, and you have to run around on it for the second Power Star. The Purple Coin challenge takes place on the reverse side of the sprite, which is coloured as Luigi. In the Space Junk Galaxy, feed the Hungry Luma and it transforms into a planet in the shape of Yoshi's head. When you first meet Luigi, he is cowering in a haunted mansion in the Ghostly Galaxy. This references the game Luigi's Mansion, where Luigi wins a haunted mansion and has to rescue Mario from inside. The Buoy Base Galaxy is a red and white ball that resembles the Poké Ball from the Pokémon series. However, it is also worth noting that both the Buoy Base Galaxy and the Poké Ball appear to be based on designs for buoys and fishing lures, which are often red, white and round. In the Space Junk Galaxy you come across an old, beat-up rocketship. It appears to be based on the design of Captain Olimar's Hokotate ship from Pikmin 2. The Red Shell item homes in on the nearest enemy when thrown. This homing effect has been borrowed from Super Mario Kart and the later Mario Kart games. Throughout the game, nozzles that shoot fire and bubbles appear. These nozzles are based on FLUDD, the water pump from Super Mario Sunshine. When Mario collects the Red Star, his colour scheme changes to black and red, copying the colour scheme of Mario's sprite in Super Mario Bros. 3, the first game where he could fly.